Bacon has an unfair reputation. If you stick to just one (or two, if you’ve had a bad day) slices, bacon can add ridiculous amounts of tastiness to any dish for shockingly few calories. It’s not that bacon is a health food by any means, it’s just that it adds a lot of punch. Having said that, this dish is not light. It’s pasta, bacon, and cheese. 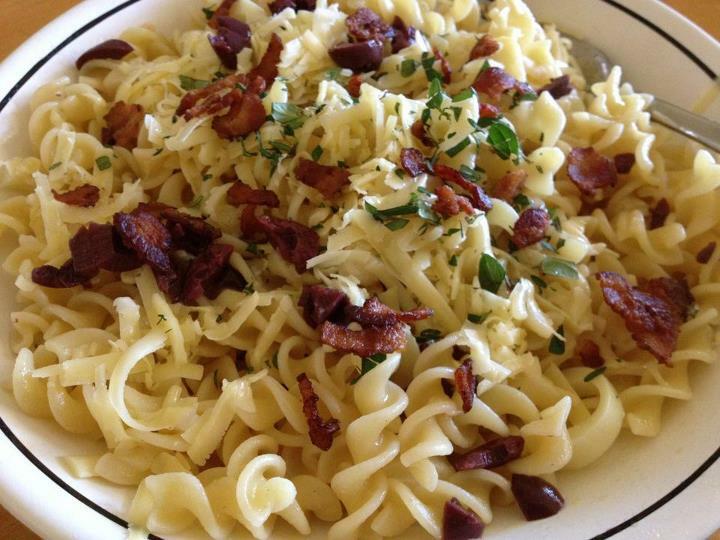 But honestly, sometimes you just need pasta, bacon, and cheese! This is one of my favorite weeknight dishes. I’m not going to give you a formal recipe because, well, cooking is more like guidelines, and it won’t hurt my feelings if you omit or add to this dish. First I boil water for a fair amount of organic pasta. While the water is heating up, I heat up a pan and snip a strip (or two) of thick cut premium bacon. I like my bacon extra extra crispy and thoroughly drained of grease. I always cook pasta with a bit of olive oil in the water. I like to pretend I’m Italian like that. When the bacon is drained and the pasta is cooked, I drain the water out of the pan, keeping the pasta in the dish. I squeeze hefty amount of lemon over the pasta and add a healthy glug (can this be a new measurement?) of olive oil. Sometimes I throw a garlic clove in there for good measure. Then I grate gruyere (I didn’t say this was a light dish) over the pasta, add chopped Kalamata olives, fresh oregano, and finish with the chopped bacon. You will be so happy with me when you eat this. Don’t forget to tweet me @krwatson. I am happy already. 🙂 Sounds so delicious! Aw, glad to hear it! The beauty is the simplicity. And bacon.